The central role an independent judiciary and legal profession play in upholding the rule of law, as well as the need for increased support for female lawyers, were high on the agenda when Law Council of Australia President, Arthur Moses SC, travelled to Malaysia and Hong Kong for his first official engagements to open the legal year. In Kuala Lumpur Mr Moses attended a Bar Leaders’ Roundtable Meeting, which discussed challenges to legal practice and how the bar and law societies were responding. 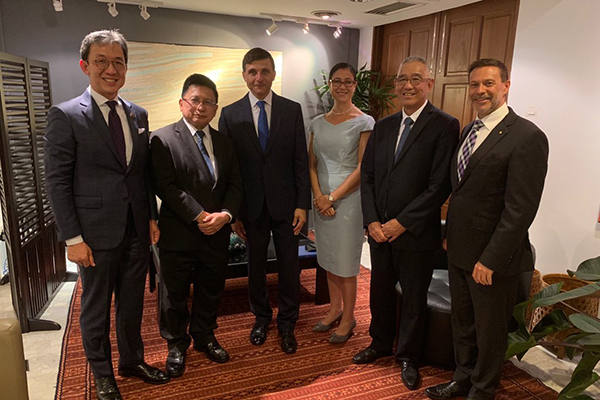 He was also invited to give an address at the Australian High Commission, attended by members of Malaysia’s judiciary, including Chief Justice Tan Sri Datuk Seri Panglima Richard Malanjum, members of the Malaysian Bar Association, and High Commissioner to Malaysia, Andrew Goledzinowski AM. Caption: Chris Leong, Past President, Bar Council of Malaysia, Tan Sri Datuk Seri Panglima Richard Malanjum, Chief Justice of the Federal Court, Malaysia, Arthur Moses SC, President, Law Council of Australia, Elizabeth Espinosa, President, Law Society of New South Wales, Datuk Seri Panglima David Wong Dak Wah, Chief Judge of The High Court of Sabah and Sarawak, and Andrew Goledzinowski AM, Australian High Commissioner in Malaysia. In his speech, Mr Moses highlighted the importance of judicial freedom and said Malaysia, despite its struggles, was emerging as a beacon for others to follow. He also praised the work of the Malaysian Bar Association and its commitment to upholding the rule of law. “The Malaysian Bar epitomises the virtues and values of a national bar association which fiercely asserts its independence, something which is widely recognised and applauded by lawyers throughout the world and particularly in the Asia Pacific region,” Mr Moses said. “In Australia, we have followed developments in Malaysia closely, especially the public statements made by Malaysian Bar President George Varughese emphasising an independent judiciary, judicial reform, and the need for the judiciary to be impervious to political pressure, to uphold and honour the rule of law. In Hong Kong Mr Moses met with president of the Hong Kong Law Society, Melissa Pang, and delegates of the Law Council ILS Hong Kong Chapter. Caption: Melissa Pang, President, Hong Kong Law Society and Arthur Moses SC, President, Law Council of Australia. 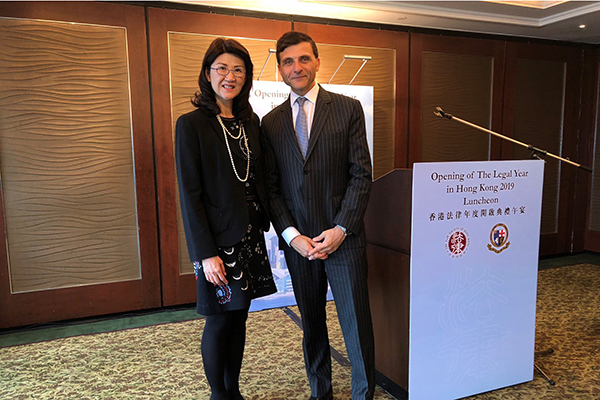 At his meeting with the Hong Kong Law Society, Mr Moses raised ongoing concerns relating to proposed foreign lawyer ratios in law firms as being a restrictive trade practice and bad for business. He also addressed a roundtable of leaders about how to retain talent in the legal profession. “Currently, the profession is still male dominated and this needs to changes,” he said. Mr Moses also presented a lecture, 2018 - The year in review, to the Law Council’s Hong Kong Chapter, which featured issues of interest to commercial law practitioners. Later, he gave an address detailing Australia’s Modern Slavery Act at a legal seminar, outlining what it means for law and business, as well as its strengths and weaknesses. “Too often we are tempted to think of slavery as a relic of the past, but the truth is it is a problem alive and well,” Mr Moses said. “The United Nations has estimated that there are more than 40 million victims of modern slavery worldwide. Around 25 million are estimated to be exploited through global supply chains. “More than half of all modern slavery victims are estimated to live in the Asia-Pacific region, where the supply chains of many large Australian businesses are concentrated. Later this month, Mr Moses will travel to the Northern Territory to provide the keynote speech for the opening of the legal year.